"Tinuruan niya po ako na di kailangan nakakunot ang noo kung kailangan magsungit sa eksena," says Xyriel Manabat (right) about her 100 Days to Heaven co-star Ms. Coney Reyes. "Many are impressed with Xyriel Manabat’s acting on the high-rating series 100 Days to Heaven on ABS-CBN. "Having to imitate Ms. Coney Reyes’ acting as Anna Manalastas is no piece of cake. 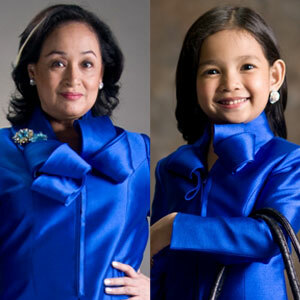 However, Xyriel delivers the role with ease and manages to portray the character very well. "Meanwhile, Ms. Coney is very much amazed with Xyriel’s talent, "I am amazed with Xyriel’s talent. Ang bilis pumick-up and mahusay talaga." "100 Days to Heaven continues to lead on its timeslot. According to Kantar Media last Wednesday (June 1), the ABS-CBN series earned a national rating of 34%—beating GMA 7’s Captain Barbell which garnered a 16.4% national rating. "Continue watching the lesson-filled episodes of 100 Days to Heaven, weeknights on ABS-CBN after TV Patrol."